DESIGN and LEED Technical Designs provided the mechanical and plumbing design services for this 100,000 square foot laundry facility in Henderson, NV. Completed in 2008, this project was the first LEED endeavor for Boyd Gaming.The project uses 350 acre-ft/year less water as compared to other laundry systems; saving enough water to serve an additional 1,000 residences. Re-use of the existing metal building available on site made the installation of the mechanical systems in the building a challenge. Because of structural limitations, Technical Designs proposed all steam, condensate, and water piping be installed in trenches below grade. The building was ventilated from five 60,000 cfm ground mounted, evaporative coolers using fabric duct distribution. 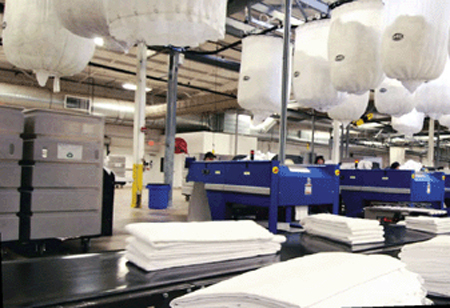 Technical Designs orchestrated the coordination and integrated the mechanical, electrical, and process requirements for six separate laundry vendors for current and future laundry needs. Technical Designs’ services included all process utilities for the laundry, including steam and hot water systems, incoming water treatment, and waste water heat recovery.